Library got a large bunch of updates and upgrades since last version and i today i will tell about the main one – new Nine-patch editor and styling hidden within the library. Nine-patch is an image format that holds some additional information inside png-format image meta-data or inside the picture itself. As you can see there are four black-colored lines on the image sides – that is additional data that nine-patch format provides. Each line on the left and top sides presents stretchable image areas – those parts of image will be sized with the component they are used on. Each line on the right and bottom sides presents content areas (they might also be empty) – in those parts of image component content will be placed (for example – button text and icon). That is basically all you need to know about that format to make it useful inside you application with WebLookAndFeel library! If you want to know more – you might find this post and official Android dev guide useful. It was already announced on HabraHabr, but it changed a lot since than and i will tell some more technical info today. On the top left toolbar you will find main control buttons used to open/save image, copy patch info and undo/redo changes. On the top right toolbar you will find preview settings – text (you can use “;” or “\n” to separate lines), its color and icon. On the bottom toolbar there are editor view settings buttons and zoom slider. On the code side this dialog (NinePatchEditorDialog) is just a small shell for NinePatchEditorPanel class that contains areas and base editor logic. You can easily use either NinePatchEditorDialog, NinePatchEditorPanel or NinePatchEditor (visual editor itself) inside your own application if needed. where “myPanel” could be any Swing Container. From NinePatchIcon you can get any edited data and 2nd method quickly assembles complete image from that data. Zoom can be any value from 1 to 32. This class is based on javax.swing.Icon interface that is used by a great amount of Swing components. It provides basic information about icon – size and how it should be painted on one or another component. NinePatchIcon extends that basic information and also provides icon preferred size (remember, the nine-patch icons are stretchable), margin and patches information which are determined from the image itself. All that additional information is used to correctly paint icon over different components. So nine-patch icons could be used to style a component of any size unlike (as an example) the static ImageIcon. But most of the components have lots of different parts or states they might switch between during the execution – how could they be styled with single image (even stretchable one)? I already told you about BackgroundPainter concept in previous post so i will go straight and show how it can be used in action. These are different button states – normal, focused, disabled, pressed and selected (this one is for toggle button). So, first of all we need a BackgroundPainter instance to style button with. There are plenty already available and supported by Web-components like NinePatchBackgroundPainter, AlphaBackgroundPainter, TextureBackgroundPainter and others. 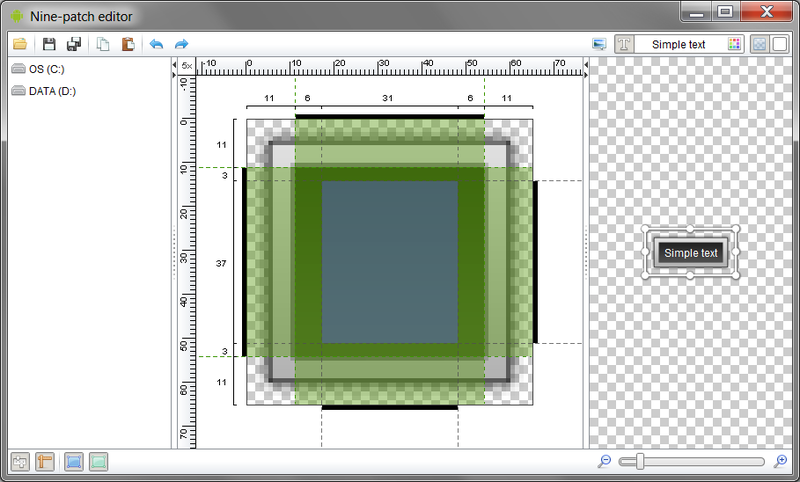 At the moment we are interested in StateBackgroundPainter which is an extended version of NinePatchBackgroundPainter and can keep different state images and decides how to use them in one or another component. We will use it for both – normal and toggle buttons since it doesn’t really matter if there is a useless state inside – it will just be ignored when painting occurs. Also notice that “focused” state is a special state since it might cover other icons when painted if the component is focused – that allows you to draw focus border separately from the other parts. Try clicking them – they will act like normal buttons. You can easily style any of them, usign different background painters (including nine-patch ones). Actual style (BackgroundPainter) support is hidden within the component UI classes (for example WebLabelUI). In next version there will be much more components styling support added like check-boxes, radio-buttons, sliders, spinners and many others. Components styling through background painters (and by nine-patch background painters in the particular case) takes much less effort than creating new or extending existing one. Still there is a room for even more simple and compact code. So the next step of simplification was moving all graphics and styling out from code into properties-like xml files. You might have noticed that in library showcase Futurico and Android styling examples does not use background painters directly, but load them from predefined xml files which are contained in demo jar. Basically this is an xml representation of ResourceMap class filled with button state resources. Single resource (ResourceFile) represents a file location (it could be url, local file or resource near some class). Since we used files from the showcase jar – all resources have “nearClass” enumeration value and also have class name field filled in. Actually xml file is not perfect yet and will be simplified with next release to remove lots of useless information, but it is still a good way to simplify your code. Plus you can always change the resources location without affecting the code (you can do it even after all the classes are compiled and deployed). For now there are three types of resources that could be serialized to xml – ResourceFile (single file), ResourceList (list of ResourceFile), ResourceMap (map of ResourceFile behind String keys). All of them can be used to simplify any massive resource files loading (for example styling graphics in our particular case). This is all for today, but i will keep telling you much more about the library with each post, so stay tuned for updates!